The XMark Functional Trainer Cable Machine with Dual 200 lb Weight Stacks XM-7626.1 comes with 200 pounds/90.7 kg weight stacks on each side of the machine just as the name implies. This is unlike the BodyCraft HFT Functional Trainer Home Gym that comes with 150 pounds weights stacks on each side and then offers 50 pounds/22.6 kg upgrade which could incur additional cost. This means that the XMark Functional Trainer is slightly cheaper than the BodyCraft HFT Trainer Home gym even though they both have a lot in common in terms of features and that also includes the Inspire Fitness Functional Trainer FT1, they are all great and recommendable trainers for the home gym. You may look them up as well if you have not finally made up your mind on the XMark Trainer. 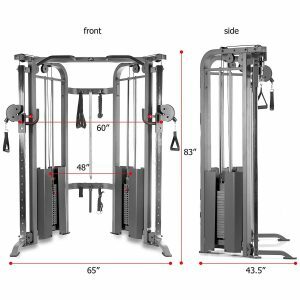 The XMark Functional Trainer Cable Machine with Dual 200 lb Weight Stacks XM-7626.1 has impressive and compelling features such as the 200 lbs weights stacks that can easily be adjusted by anyone, old or young, tall or short, it doesn’t matter. No need to be moving weight plates in and out of the machine each time you wish to increase or decrease the weight resistance. This does not only saves time but also prevents weights from dropping on the floor or even your foot. Each weight plate weight about 10 lbs which means you can only do an increment of at least 10 lbs weight, but if you are wondering if you could do less, let’s say 5 lbs then you may have to go for the 5 lbs weight stack adaptor plate made by BodySolid. The machine is made with commercial grade steel that is durable and can withstand any type of hard use. It is also very stable, no tipping or wobbling will be experienced during exercises and you do not have to bolt it to the floor because the weight is heavy enough to keep it conveniently grounded. Click right here to have a peek at the discounted price of the XMark Functional Trainer Cable Machine with Dual 200 lb Weight Stacks XM-7626.1 on Amazon. 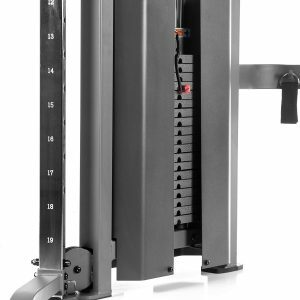 The frame of the XMark Functional Trainer Cable Machine with Dual 200 lb Weight Stacks XM-7626.1 is made of 11- gauge 2 inches by 3 inches rectangular steel. The frame is finished with a gray/black color that is anti-corrosive. You also have the option of choosing the trainer that is coated with white anti-corrosion paint instead. Both the gray/black and the white painted trainers are one and the same because they have the same functionality except for the colors. The tubular guide rod is chrome finished. The trainer is large but still won’t take up much space because of its overall design. It has this V-shaped design that could easily fit in a corner of the room. Moreover, it does not require any additional clearance behind it or on each side of it in order to conveniently perform all the exercises. All the exercises can be performed at the front of it. The functional crossover trainer also features a set of spit grip pull-up bar for chins-up and pull-ups. The assembled dimensions are 65 inches wide by 43.5 inches long by 83 inches tall. In other words, the required dedicated workout area for this unit should be 5.4 feet wide by 3.6 feet long and at least a ceiling height of 8 feet so that you can have enough space for chin-ups/pull-ups exercise. It is also a pretty heavy trainer that weighs about 800 pounds/362 kg; this is the reason why the unit must be installed in a dedicated area where you wish to use the machine because it cannot be moved except to dismantle and relocate it and then reassemble it again which could be cumbersome. NO need to hook it up to the floor in order to make it stable, as you may already know the weight is heavy enough to keep it extremely stable. No movement or wobbling during chin ups or any other exercises. The bases of the machine also have rubberized pads that make it floor friendly, although it is still recommended to install it on a large protective rubber mat. The XMark Functional Trainer Cable Machine has a dual 200 lbs/90.7 kg weight stacks which are one of its selling points because there are other trainers in the same category that have lesser weight stacks but instead they offer upgrade options that could cost more. There are 20 weight plates on each side of the weight stacks and each of the weight plates weigh 10 lbs and it is about 1 inch thick. This means a user can increase or decrease the weight resistance by 10 pounds, but you can purchase a BodySolid 5 lbs adapter if the 10 pounds increment is too much for you. As aforementioned, the adjustment of the weight resistance is as easy as eating a piece of cake. You don’t have to move weight plates back and forth each time you wish to make a change to your weight resistance. 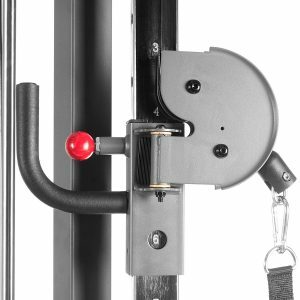 All you need to do is to move the safety lock pin to the weight resistance level you wish to workout with. It is very safe because each weight stack has two tubular guide rods that keep the weight plates in order while they are in use. The weight stacks are spaced at 48 inches apart. The weight plates are durable because they are made of cast iron as opposed to cement or any other material, therefore, they could last forever. Finally, the weight stacks are not upgradable but as aforementioned, you can use the BodySolid 5 lbs adapter to reduce the increment from 10 lbs to 5 lbs. The XMark Functional Trainer Cable Machine with Dual 200 lb Weight Stacks XM-7626.1 has a set of adjustable pulleys that are 60 inches apart. There are 19 heights adjustable positions available to enable you to perform all the variety of workouts possible. Each height adjustment is 3.5 inches apart. There are other several pulleys present on this unit aside from the main outer set that have the handles on them. These pulleys are made of heavy-duty nylon material for durability and integrated with sealed ball bearings for smooth operation. The adjustable set of pulleys could swivel 180 degrees sideways therefore very versatile for any type of workouts or exercises. The highest height position is 6.6 feet while the lowest is 1 inch. The pulleys allow you to train like a pro on a limited front space of the trainer. The cables could be extended to up to 81 inches from the pulleys. This offers enough length for free movement during an exercise. The cables are also very durable and strong as they are aircraft quality steel ropes that are encapsulated in a PVC material so that the movement over the pulleys will be smooth and friction-free. This is the accessory that is not included in the package but optionally available for you to purchase if you deem it necessary. Of course, the FID bench is necessary because it will enable you to perform exercises such as the chest press, incline press, and seated shoulder press. The approval rating of the XMark Functional Trainer Cable Machine with Dual 200 lb Weight Stacks XM-7626.1 is pretty good. At the time of this review, there are 29 Amazon customer reviews with an average approval rating of 4.7 stars out of 5 stars. This is compelling evidence that the functional crossover trainer is worth the investment. The XMark Functional Trainer Cable Machine with Dual 200 lb Weight Stacks XM-7626.1 in 8 heavy boxes that weight about 827 pounds/375 kg. The shipping cost varies depending on which vendor is selling the machine to you. Nevertheless, some retailers such Amazon provides free shipping to the United States residents. The assembly of this functional crossover trainer takes time as there are a lot of parts to be put together. It will require at least two persons to assemble it. It could take about 4 hours, more or less to completely assemble the unit. All the tools required for the assembly and the instruction manual that guides you through the process of the assembly are all included in the package. No major maintenance needed but it will require you to be applying silicone lubricant onto the parts such as the guide bars of the weight stacks and the pulleys for smooth operation. Moreover, always examine the unit for any loose or broken part. The XMark Functional Trainer Cable Machine with Dual 200 lb Weight Stacks XM-7626.1 is a recommendable functional trainer for the home gym. It is very strong, durable, versatile and cost-effective. Adding the XMark Functional Trainer to your home gym is a good investment.